Above: Nintendo Game Boy box art. An arms smuggling ring threatens to create a new world order. The peace and security of the entire planet is at stake. MI6 sent agent 008 deep into Turkey to dismantle the operation. Soon thereafter, all contact was lost. M makes the decision to send their best agent, James Bond, to investigate the whereabouts of 008. As Bond carries out this latest order, he becomes entangled in his deadliest mission yet. As James Bond, you must use all of your expertise to unravel the sinister plot. It is up to you to determine friend from foe as you uncover clues. along the way, weapons and items will be found that assist you in overcoming the many obstacles placed in your path. be sure to keep an eye open for Q and his unique brand of help - you can't afford to rely on your wits and charms alone! Bond is once again in the thick of things, this time traveling the eastern hemisphere in order to stop an elite weapons smuggling ring. In order to do so, Bond must use all of the weapons and gadgets on hand, including the trusty laser watch, pistols, AK-47's and more. Bond will also have the chance to visit the casino, where you can spend some cash on blackjack and the like, while some of the most famous Bond villains make appearances in the hopes that they will stop the secret agent from completing his task. James Bond 007 was published by Nintendo for the Game boy - its title not to be confused with the 1983 game of the same name developed by Parker Brothers for the Atari 800, 5200, 2600, Commodore 64, Colecovision and SG-1000. The 1998 Game Boy title was developed by Saffire Corporation. Based in Utah, USA, the company was founded in 1995 and is still going strong today. 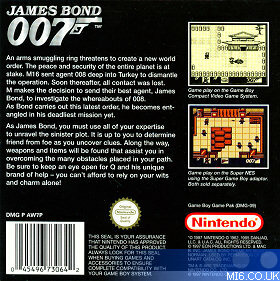 James Bond 007 was the first Bond game for a handheld platform, and was Nintendo's second licenced title after "GoldenEye 64" in 1997. Because of the game's rather unexpected spectacular success, Nintendo re-released the game after it broke the million seller mark. Above: James Bond's first mission is based in China. Following the spectacular "GoldenEye 64" in 1997, Nintendo released their next exclusive 007 game a year later for the Gameboy handheld. Rather predictably, "James Bond 007" follows the tradition of role-playing games on the Gameboy with Nintendo enjoying success with the genre on titles such as Links and Zelda. 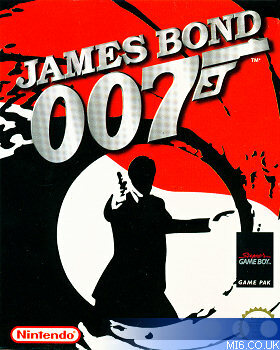 Unlike "GoldenEye 64", which introduced a lot of new ideas to its genre, "James Bond 007" for the Gameboy recycles the well-trodden Nintendo RPG format with little originality or innovation. The plot of the game revolves around 007 achieving various mission objectives in China, Kurdistan, Marrakech, Russia, Sahara, Tibet... and along the way discovering the fate of agent 008, and stopping an evil Russian General from destroying England with atomic rockets. The game is composed of ten missions (although the "London" mission is just a briefing) which vary in length considerably. The writers of the game must have struggled to keep the plot close to a typical Bond story though, as 007 is often stealing trivial items to trade for others in order to advance in the game (in one instance, 007 has to steal a chicken to get a cat!). The learning curve is well pitched, with features and puzzles being gently introduced through the missions with a gradual increase in difficulty. Despite the RPG format, the plot is quite thin and most of the characters are not that well defined. Like "James Bond: The Duel" five years earlier, "James Bond 007" brings back some familiar faces. Oddjob and Jaws make appearances in the fourth and final missions respectively, and the usual MI6 staff are in attendance. Compared to most Bond games that had been before, "007" makes a pleasant move towards the movie structure with pre-titles mini-mission, MI6 briefing, adventure, gambling, character involvement, climatic action and a sprinkling PG rated innuendo. There is also the necessary Bond girl, in the shape of Zhong Mae, who despite being on the wrong side of 007 early on the game, is almost a carbon copy of Wai Lin from "Tomorrow Never Dies" (1997). Other influences from the movie series can be seen throughout the game, for instance Golgov is thinly veiled use of General Gogol from the Moore/Dalton era, and the magnetic defeat of Jaws is clearly taken from "The Spy Who Loved Me". The gameplay consists of moving Bond around a series of screens via pathways and doorways, "interacting" with characters by talking to them, finding items around the map, solving puzzles by using items, and battling goons. It is standard fair for the RPG format, but it is the fighting that lets the game down. Enemies can be dispatched simply by blocking their moves until the animation stops, then unleashing a punch and quickly going back to block. Shooting enemies with guns is slightly more challenging, as blocking will not stop their bullets - instead players have to move around the screen to dodge incoming fire. The controls are hampered by the Gameboy's limitation of only two main buttons, and these have to be configured by the player via the inventory screen to assign different actions or items to the A and B buttons - which can quickly become tiresome. Limitations aside, the game is almost free of bugs (the only annoying flaw found is when players have to negotiate rocky caves), and the puzzles are quite logical - unlike other Nintendo RPG titles. Graphically, the game makes the most of the limited hardware with well designed characters and backgrounds - considering the restrictions of the Gameboy. Likewise, the music comes across well on the handheld, with a well produced version of the James Bond theme and location specific tunes. Sound effects are lacklustre though, with simple beeps signifying events and no special sounds for goon deaths. On the whole, the game plays quite well, but does suffer from repetitive gameplay and a luck lustre fighting system. Longevity of the main game is limited, as there is very little to replay once missions are completed, but some future value is supplied with the card games that crop up in the plot. These three games (Black Jack, Red Dog, and Baccarat) can be replayed after missions have been completed, and offer some limited value (this feature was repeated in 2003's "Everything or Nothing" for Gameboy Advance by EA Games). Viewed within the era that "James Bond 007" was released, the Gameboy system was starting to slide down the slippery slope of popularity and age, but that did not stop sales surpassing the million mark with Nintendo's tried and tested RPG format working well on the handheld platform. Like "The Stealth Affair" released on the PC in 1990, without the name checks to James Bond, the game could easily be mistaken for just a generic RPG title, with 007 flair in short supply. This was the last RPG game for the Bond licence to date, and with a rich catalogue of characters and adventures to plunder from, it may warrant a revisit with the new generation of handheld hardware. Above: Screenshots from various locations in the game. Punch - At the beginning of the game, Bond can only punch. Sometimes, this will be Bond's only option. Block - Bond can block attacks from enemies. Service Pistol - Bond's standard issue weapon. A handgun that can usually be found wherever 007 is. Machete - As well as a weapon, the machete can also hack away brush that is in Bond's way. Sub-Machine Gun - A rapid-fire weapon that can shoot three rounds at a time. Grenade - Grenades are more powerful and have a larger area of effect than any of the guns. Missile Launcher - The most powerful weapon in the game. Bullets - these bullets are the lethal part of Bond's Service Pistol. Sub-Machine Gun Ammo - Bullets for the Sub-Machine Gun. Missiles - The missile that is used with the Missile Launcher. Bandages - These are used automatically to replenish part of Bond's health bar. Med-Kit - Bond can store these items whenever his health is getting low. Field Communicator - M and Q can communicate with Bond through this item and give him helpful information. Electric Key Chain - One of Q's helpful inventions. The special key chain can help 07 stun even large enemies. Lamp - bond must find this item if he wants to explore caves. Night Vision Goggles - Used to see in dark areas without tripping off nearby enemies. Laser Watch - This Q invention allows Bond to cut through locks. Satellite Link - 007 can use the Satellite Link to find his location on a map. Water Canteen - Take a full canteen of water if you hope to make it through the desert. Grappling Hook - With this, Bond can reach high places he normally could not on his own. Bullet Proof Vest - bond can withstand some of the damage from bullets. Exploding Pen - This pen is a one use item, so use it wisely. Titanium Shield - Bond can use this to deflect bullets and items. Mirror - The Mirror is Bond's only defence against lasers. Above: Above: Screenshots of the blackjack sub game and inventory screen. The directional arrows make your character move in eight different directions. This also moves your cursor. Press SELECT to see you Sub-Screen. In the Sub-Screen, you can assign different items or weapons to the A and B buttons. You can assign different items (functions) to the A and B Buttons. both buttons will also let you talk to people and search for hidden items. Press START to save your game. You can make your character move up, down, left, right and diagonally by pressing the +Control Pad. Press the A or B Button when you are near characters to engage in conversation. Your character will not be able to speak to everyone. You can also search for objects in the same way. in either case, if the message is very long, you have to press the A or B Button to see all of it. You will have other items and moves to choose from. When you get a new item, test it out in a variety of situations. Also, be ready to switch to the item appropriate for the situation you are in. Casino Secret - Go to the casino in Marrakech and play any one of the casino games. If you win about $17,000 the opponent will tell you that you are a high roller and the casino has paid for your visit. Return to the hotel and talk to the hotel manager (behind the desk.) He will give you the presidential key which you can use to open the locked door on the first floor. Unlimited Med-Kits - Start the game and enter the house. Get the med-kit from the top bed, then save and quit. Reload your game and enter the house to find another med-kit. You can repeat as often as desired. "Decoder' Bond, now that you have arrived in China, we can provide you with more details on your mission. MI6 received a tip from an operative that a large arms ring is in operation. Plans detailing the whereabouts of this ring are said to be kept in China. Commandeer them and return to London as soon as possible. And 007, talking to people may prove helpful. Do so by standing next to them and pressing the A or B button. Search for items the same way. Walk up to an object and press the A or B button. We look forward to hearing from you, 007." After the long introduction above, enter the house on the screen. Go behind the top bed and press the B button. You will find a medical kit. Now, exit the house. Walk left once and enter the house on the screen. Go behind the top bed again, press B, and you will find a hammer. Exit the house and walk down the path on the screen. After two screens, you will see a house. However, continue walking until you come to the 2nd house. Go into the house. Go behind the top bed and press the B button. You will find a second medkit. Now, go back to the screen where you first started the game. Go to the right and you will find a man sitting beside a broken bridge. Go to your select screen, select the hammer, and it will be binded to either an A or B key. While near the man, press A or B and you will give him the hammer. Go back to the left, go back to the bridge, and the bridge will be fixed. Go across the bridge and follow the path until you come to a guard who says "Halt! Who are you?" Defeat him using the Punch and Block keys and enter the place he was guarding. Now, you will be in a temple. Here is a path to get to the secret plans: Go up, and go to the right by walking through the candles. When facing the wall, and being in the middle of the wall, press A and you will discover a secret door. It may look strange, but walk through the pillar and you will be in a safe room. Before you go up one screen, go to the lower right cabinet and press the BLOCK button. You will find a key. This key is used to open a safe in the above screen. Go to the above screen and you will find the safe in the northeast corner of the room. Bind a key to the key via the method above, and you will open the safe and get the secret plans. Now, head to the door on the left side of the room. In this room, you will meet Zhong Mae who is the first boss of this game. Your blocks will have no effects on her so move towards her and punch, and move back, move towards her, punch, move back, and so on. Eventually, you will beat her. Go down, and down one more screen to get out of the temple. You will come out the right side. To get out, you will have to face a lot of guards. When you come against them, hold down the block button, when they switch their feet, punch them. Most guards will be killed with one hit although some guards take two. Fight every guard until you come to a door that is similar to the temple door. Enter the door and you will see a scene with James Bond in a boat driving away. Start the mission by going left one screen and talking to M behind the desk. Give him the secret plans you got from China. After the conversation with M about 008 and Iqual go up one screen and right one screen. Talk to the man at the top of the desk and you will meet Q and he will give you your sidearm. Talk to him again and he will give you an explosive keychain. Go to the object above Q and press A. Q will say not to touch that but touch it again. Go into the wall it just blasted through and get the round object that's on the right side of the screen. This is the M.A.R.B.L.E. Go left one screen and down one screen. Talk to the woman in the bottom part of the room and she will say that she has something in her cabinet. Open the cabinet to the northwest of her and you will discover a medkit. Now, go Up, Left, Down, and right. You will come to the same room you started the mission again. Go right one more time and you will go to Kurdistan. Start the mission walking right and going into the house you see. Talk to the man in the house and get the medkit from the upper left corner. Go right one screen, up one screen, and left two screens. Here, you will see a house. Enter the house, talk to the man, and he will give you a gold ring. Go back to the house you were in where you got the medkit. To get to it, go right two times, down once, and left once. Come out of the house and when you are out, go down one screen and to the right one screen. Go into the house on the left, talk to the man, and he will say that he lost his machete. Go out of the house and go into the right house. Look in the cabinet in the upper left corner and you will discover the lost machete. Go back to the left house, talk to the man, and he will allow you to keep the machete. Go out of the house and cut the grass in the middle of the houses. Go up two screens, left one screen, up one screen, right one screen, left another screen, and up one last screen. Go in the house, look in the cabinet and you will find a pad of paper. Retrace your steps back to the houses and find a house that has two cones on the forward part. This is the prison. Go inside. In the prison, talk to the prisoner and give him the gold ring and then the pad of paper. Talk to the guard, go out of the prison, go back in the prison, talk to the prisoner and he will give you the pass he forged. Go out of the prison, go up one screen, and left one screen. Bind a key to the pass the prisoner just gave you and use it on the house door that is to the right of the screen. Go right one screen and you will notice a guard guarding a passageway. He will not let you pass. Pull out your gun and shoot the light to the top of the screen. Now, go through the passageway. Get the lamp that is on the right side of the fence. Open the gate, go up one screen, right one screen, and up once more. During this time, you will encounter four or so guards. Before you go into the cave, cut the grass to the right of the cave entrance, climb up on the rocks, move to the bottom of the screen, move right, and you will see a man...and a lot of medkits. Cut your way through the grass, talk to the man, get the medkits, and go back to the cave. Now, enter the cave. Walk up one screen and get ready to fight the game's second boss who's name is Iqbal. To fight him, make him step on the stun keys and hit him with your machete. Get him to the top of the screen, and get behind the stun keys. He will walk into the stun keys and you can chop him up. He will then retreat, and walk into the stun keys again. Chop him up again. Do this until he is dead. He drop prisoner keys. Walk down one screen and right one screen, and up one more screen and you will see 008 who is locked up. Use the prisoner keys to open the gate, and go talk to 008. Mission complete! When you start the level, talk to the man at the top of the screen and you will get your room key. From your current location, go down to get out of the hotel, left, down, left, up, and left once more to get to the casino. Enter the casino, go up one screen, and right one screen. Talk to one of the two people in the room behind the window and you will get $1000 currency. Head down one screen and either play BlackJack or Red Dog. When you have won $2500 go up one screen, left one screen, and into the passageway on the top of the screen. After you've played for awhile, quit the game, and and see if there is a man on the left. If there is, leave the casino. After you are out of the casino go right, down, right again, and enter the passageway on the right side of the screen. Go inside and follow the pathway. When you come to a room with two paths, take the path on the left. Now that you are outside the passageway walk right, down, right, and into the room. When in the office, walk right and talk to Q. He will give you a laser watch. Now leave the room and go left, up twice, and inside the passageway. Once again, follow the path until you come out. Walk down one screen and right one screen. Enter the room, give the man the jeweled egg, and he will give you a pass. Walk back to the underground passageway and find your way back to the Q Branch office. When you've arrived at the entrance, go left, up twice, and inside the passageway. When you get outside, go down, right, down and into another passageway. When you are out, go right, up, left, and up once more. Then, go into the second passageway and you will eventually come out in a room with a man. Now, you are in the Black Market. Head South, South again, and go into the first passageway (on the left). Once out of the passageway, head Left, Up, Left, Up, Up again, and right. Talk to the man who sells chickens and James will automatically steal one. Now, go down, left, down, right, and inside either of the two doors. Give the man the chicken you stole and he will give you a cat. Now, get out of the room, and go left, and down. Enter the passageway. Give the merchant the cat and he will give you a Pearl. Get out of the room, walk up twice, and enter the room. Give the man on the right side of the screen the Pearl you got from the merchant. He will give you a passport. Exit the room. Go left, down, left, down, and enter the room. Give the passport to the merchant and he will give you night goggles. Exit the room and walk to the north part of the Black Market. Eventually, you will come to a room in the fence. Go in the room and activate your Night Goggles. Note that there are many guards in this room so make sure you have some medical kits. Walk down, left, down, left, down, down, right, right, up, right, right, up, and right once more. Burn the lock with the laser watch Q gave you and talk to Miss Bliss who is the rather large lady in the room. To get to her, go northwest. You will appear outside and she will have given you a jewel. Now, go right twice, up, inside the passageway, down, right, down, inside yet another passageway. When you emerge out, go right one screen, and into the passageway you see. He will give you a satellite link. If you need it, there is also a medical kit in the cabinet. Get out of the room, go to the upper left path, up, inside a passageway, inside the second passageway, and you will be in the Black Market again. Find your way back to the catacombs. (Head North at every opportunity and you'll eventually get there) In the Catacombs, head Down, Left. Down, Left, Down, Right, Right, Right, Down, Left, Left, Left. You will find an injured man. Give him the diamond and he will give you a Tranquillizer Gun. Now, go right, right, right, up, left, up, right, and right again. Use the laser watch on the door and go inside. Go up the passageway, take out the Tranquillizer gun, and shoot Mr. Fez. Sweet dreams. Leave the catacombs by leaving the room, going up, and going right. Walk inside the door, walk left, then walk down. Find your way back to the Casino through the maze of streets and Catacombs. Enter the casino, and walk up two screens and you will be in the High Roller room where you first found Mr. Fez. Search his body by using the action button and you will discover a set of keys. Leave the casino, and go back to the hotel. Since it was so long ago the directions are, Right, Down, Right, Up and Right. Once in the hotel, head right, and go through the door at the top of the screen. Move about three or four screens to the left and eventually you will come to the end of the hallway. Open the last door on the left with your set of keys you got from Mr. Fez. Inside, you will find Oddjob. He will throw at you millions of bowler hats. Let him kill you. Walk up and talk to the man that is on the Camel. He will give you a canteen. Go back down one screen and fill your canteen at the water well. Please note that this level is quite annoying because when you run out of water, you die rather quickly, and you have to dodge scorpions which is rather difficult. Head up, up, up, up, left, up, left. Head into the door. Go into the door that James is below. Go up, and go to the southeast of the pool-like object. Search the place and you will find a medical kit. Use it! Exit the building and follow the path on the screen. When you come to a cave, enter it. Don't forget to turn on your night vision! Walk down, then down once again. Follow the path up until you come to another cave. Enter it. Walk left one screen, fight the guard, and go up two screens. Search the table farthest to the left and you will discover...a machine gun. Now, get back to the room where you started in the cave. Go up twice, right, up three times, left two times, and up to and walk out of the cave. Now walk left one screen and enter the Metal Shop. Take one of the hooks on the table and then leave. Walk left and you will come to a room with a ladder. Walk up the ladder. Climb them all to the top. When you are at the top, walk right one screen, and climb another ladder. Enter the cave. Walk down to the ledge and drop down. Kill the guard if you want, and walk down twice. Now, you are out of the cave. From the cave exit, go up the ladder and across the bridge. Talk to the Monk (he looks like a head with a snake below it) and he will give you a hookshot. Now, you must find the Temple. Now, it was a pain for me to find it so you'll have to find it yourself. Hint: Use the caves. Get the metal shop, go left, go up the ladders, go left, hookshot up to the statue by releasing the grappling hook and when the arrow is on the statue, press the grappling hook button to pull yourself up. Go up the ladders and then go inside...the temple. When you go inside, you will be stripped of your weapons. Go into the right room. Here you will see a bunch of sumo wrestlers. Kill them the way you killed the guards during the first mission in China. (Block, Wait until feet are switched, punch, repeat until all are dead). You have to be quick because they change their feet a lot faster. When all are dead, enter the room that just opened... More sumo wrestlers. You must do this to all the rooms until you eventually come to a room with two monks. Walk up one screen and you will be surrounded by guards...and Oddjob. First, go up and press A to open your cell door. Zhong Mae will help you get out. Go up a screen and talk to her. First, of all get some weapons. Walk left until you come to a room with a pistol. The pistol is in the southwest corner of the room. You will also probably need some a weapon that is better than your PPK so...and some medkits so go down a few screens until you come to a hallway to to right, get the two medkits in the room. Now, fight the guards, go down all the screens and you will get a machine gun. Go back to the room where you talked to Zhong Mae. Go right, and continue to go right until you come to a room with a bunch of guns and crates. Kill the guards, then kill the guard with the rocket launcher. You will get a shield. Now, you must get to the tank room. Walk down until you get to another room with crates. It shouldn't be too hard because now you have a shield to stop the enemies bullets. However, the shield cannot stop rockets. Go to the lower-right table and you will get some grenades. Now, go left. Follow the path, then go up when you can. Go up until you come to another room that is like an armoury then go right. Now, go up. You are now in the tank room. Now, walk right, up, right, down, up twice, left twice, up, and right twice. Now, you will come to Oddjob. Get your medkits ready. To defeat him, use your shield to deflect the hats he throws at you. He will tell you about someone named Golgov. Leave the room and retrace your steps back until you are outside of the tank room. (Left, down, right twice, down twice, up, down, left, and down again.) Now, find Zhong Mae, talk to her, a door will open after she's finished talking, go inside. Mission complete! Remember this place? It's Kurdistan except it has been bombed. Start by getting a machete. Go right, down, right up twice, left twice, and up again. Talk to the man lying down and he will give you a Machete. Now, go right three times and up once. Sadly, he is dead but Bond finds an exploding pen. Now, walk down, and left. Cut the brush at the top of the screen to get up. Use the exploding pen to get rid of the boulders. Walk up. You'll be in a place with a lot of grenades being thrown around. Eventually, you will get to some kind of camp. Kill the guards around, find the rocket launcher, and go inside the big tent. Just hit him a lot with the rockets and you will beat him. Now, go up twice, right, and down. Navigate yourself to a cave. Eventually, you'll find some warehouse-like buildings and you will find Sadam. Shoot him just a few times to get rid of him. Now go left, down, right, down twice, left, down, up, left, down twice and inside the cave. Now go up, right twice, up, right and you're inside another base. Fight the guards until you come to a house with Mustafa in it. Talk to him and you will get a mirror. Leave the tent, then go down one screen. Talk to the man and he will tell you that he will guide you to Russia. Mission complete! Go left, up twice, left twice, and down. Then follow the path. When you come to a fork in the road, go left and follow the path. When you have another choice, go right and follow the path. Now, keep going right and choose a path and go down. If you choose the correct path, you'll end up at a building where Jaws is. If you choose the incorrect path you'll just end up at a dead end. When you fight Jaws, lure him to one of the magnets that come down for about three seconds or so. When he comes to the magnet, he'll be stuck to it for about three seconds so shoot him with your rocket launcher. When you shoot him three times, he will die. The last mission... Walk all the way right and talk to Zhong Mae who is tied to a rocket. Now, go left one screen. Walk up and get the guard out of the way. Flip the switches until the door opens. Walk up, right, and down to the next room and you will see three switches. Flip the switches Up, Up, and Down. Retrace your steps back and go left twice then up. Kill the guard then flip the switches Up and Down. Go into the room with the switches and flip the switches Up Down Up. Retrace your steps back, go right, and up until you reach an intersection. Now go left, and up. Flip both switches down and continue up. Flip the switch on the right up and the left down. When you get to the switch room the switches should be Up Down Down. Retrace your steps to the intersection. Go right twice, and up. Flip both the switches on the door and continue. Flip the next switches down and up. Follow the path and switch the switches to Down Up Up. Retrace your steps and go down one screen. Follow the path and switch the switches Down Down Down. Retrace your steps and go left twice, and down. When you are at the room, switch the switches Down Up Down. Again, retrace your steps and go right and up until you get to General Golgov. Beat him using any gun and watch your health and use your medical kits. Follow the path and watch out for the electric things on the floor. Talk to Zhong Mae and keep following the path. When you get to the computer, pull the lever down. Now, go back up, right, and down. Pull the second lever. Do this method until you get to the lasers. After you have deactivated all the switches, lasers will be shot at the wall. To deactivate the lasers, go back to the last switch you switched, and turn it off. To get past the lasers and bullets use your mirror and shield to block them. The bullets are the small projectiles and the lasers are the long projectiles. Once you're past them, go left, and up as soon as you can. Pull the lever on the northeast corner of the room. Go left one screen and do the same for the second missile. Then, go left another screen and do the same for the third missile. Now, go right and go south when you can. Go down to the bottom of the room and go left. Go up when you can, go left one screen, and disarm the fourth missile. Go right one screen and down all the way. Then, go right until you come to another set of turrets. Go up all the way and talk to Zhong Mae. She tells you to shut down the power grid. Do this by pulling the switch to the left of her. Game complete!